Cats may not be as persistent as dogs when it comes to begging at the foot of the dinner table, but they do have this tendency to give us “the look”. It is true that we need to give our feline friends only the most complete and nutritionally-balanced meal they deserve. But we can also give them some of the foods that we humans love. 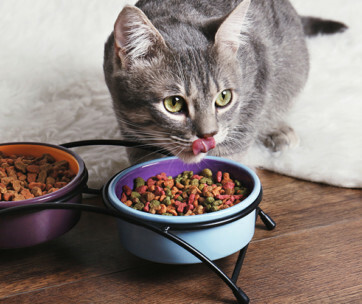 We only have to be cautious about the kinds of human foods that we give to our feline pets. After all, we don’t want to put them in harm’s way as a result of our desire to share with them the bounties on our dinner table. 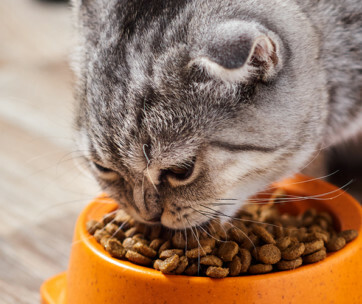 You can start with our list of the human foods that cats can eat. Cats thrive on meats. We have to emphasize this despite the growing notion that we can feed cats plant-based foods. They are strict carnivores and are very unlike dogs that can do well on either animal and plant foods. It is for this very reason that we can give our pet cats meats like beef, pork, venison, lamb, and what have you. There are a few things we should always keep in mind when giving meats to our cats. Raw meat is best since it mimics what cats in the wild feed on. The sad thing about giving raw meat is that we can never be too sure about the quality and safety of these food items. The safest way is to grow an animal and to butcher it ourselves. This way, we can be sure that the meat we are giving to our feline friend is of the highest possible quality. If you can source your raw meat from a reputable butcher, then you should get meat from him. Given that we can never be sure about the safety of giving raw meat to our feline pals, we can cook the meat ourselves. In cooking, it is best to boil it in water. It is very tempting to fry it, but this can increase the amount of fat in the meat. You may also grill it if that’s your preference, but make sure not to put any other seasoning like salt and pepper onto the slab of meat. Garlic and onion are also a definite no-no as these contain substances that are harmful to your pet. Putting too much salt can also affect your cat’s kidneys. As you may already be aware, cats are very prone to developing kidney diseases. Increasing their salt intake can predispose them to the formation of kidney stones. This can increase their risk of kidney failure. In the same way as meats, poultry can be a great human food to give to cats. The best is skinless chicken as you don’t want to give more fat than necessary. You can go for strips of chicken breast or fillet a chicken leg. Boiling your chicken is one of the safest ways to kill germs that may be present in this kind of meat. As always, don’t add anything else like salt and pepper. You should also avoid adding onions, garlic, and other spices as these may cause some harm to your pet. It is tempting to give fresh raw chicken. Again, if you can guarantee that the raw chicken meat you are giving to your cat is free from any contamination, then you can give your cat raw chicken. Remember to remove the skin. Other poultry that you may want to give to your feline pal can include turkey, quail, and duck. These are rich sources of proteins, minerals, and vitamins. They also contain essential fatty acids that can help with your pet’s coat. There is an ongoing debate regarding the need to feed cats with fish. On one end of the spectrum are those that say fish is not part of the ancestral cat’s diet. If you look a lot closer at the origins of the cat, you’ll know that it is a desert dweller. Have you seen fish in the desert? There is also the issue of fish not being nutritionally-complete. It is possible that a cat that subsists only on fish may develop thiamine deficiency. However, one cannot discount the fact that salmon and other similar fatty fish can be beneficial to one’s pet. Salmon, sardines, and herring are three of the richest sources of omega-3 fatty acids. One of these fatty acids is DHA and is responsible for brain and eye health. The other fatty acid is EPA which plays a role in the regulation of the immune function. As always, it is best to cook the salmon before you give it to your pet. There are some human foods that you can give to your kitty raw. Salmon is not one of them. Eggs are one of the world’s most nutrient-dense and nutritionally-complete foods. It has protein and fats as well as B vitamins and minerals. The eggshell can be an excellent source of calcium for more robust bones and stronger muscle contractions. Some pet parents pulverize the shell and sprinkle it onto their cat’s food. The issue most people have about eggs is the risk of food-borne diseases like salmonellosis. You can counter this by cooking the egg before giving it to your kitty. Making hard-boiled eggs can also help you avoid biotin deficiency in your cat. You see, the egg white contains avidin, a type of protein. Avidin binds to biotin which makes it difficult to absorb. Biotin is an essential B vitamin that your cat cannot produce by itself. It can only get this from its diet. Eggs are good sources of biotin. But if you do not cook the egg well, there’s a chance that your cat may not absorb the biotin in its intestines. Some pet parents are wary of giving their cats the egg yolk because of its fat density. What you need to understand is that the egg yolk is also rich in DHA and Arachidonic Acid. DHA is important in the maintenance of eye and brain health while AA is responsible for keeping the integrity of the brain, liver, and muscles. So give your cat a piece of whole egg so it can get all the nutrients that it needs for growth. Don’t worry, we’re not going to turn Felix into Popeye. This vegetable is rich in vitamins C, E, and K. It also contains vitamins B6 and B9 as well as folic acid, calcium, and iron. Spinach is one of the healthiest treats you can give to your cat. You can blanch it before giving it your cat or sauté it in a little extra virgin olive oil. This vegetable also contains glycoglycerolipids. These are substances that can coat the inner walls of the cat’s digestive tract and help minimize damage resulting from inflammation. Spinach is perfect for cats that suffer from frequent gastroenteritis. It is also ideal for cats with other inflammatory conditions of the gut. However, spinach is not for every cat. Since the vegetable is a good source of calcium and other minerals, it has the tendency to worsen the formation of kidney stones. To be more specific, spinach contains calcium oxalate, a compound that is an important element in the formation of urinary stones. So if your kitty already has kidney or urinary problems, it is best not to give spinach. A little piece of cheese like cheddar, Swiss cheese, and cottage cheese will give your cat additional proteins. It’s also great for its calcium content. The only issue with cheese is its high fat content. Majority of cheeses also contain too much salt that may aggravate your cat’s kidney problems. As such, you should give cheese to your cat only in moderation. Now, if your cat happens to be lactose-intolerant, you might want to skip this human food. It can send your cat to its litter box on a more frequent basis than you’d like. This also means more frequent cleaning for you. A more important consideration is the pain and discomfort that lactose intolerance can bring to your pet. Raspberries and blueberries contain powerful antioxidants that provide many health benefits. This can help promote a healthier cardiovascular system. Cats, as we know, are also prone to cardiac problems. Giving raspberries and blueberries as a treat will never hurt your purring kitty. As a matter of fact, it will thank you for it. These berries can also help improve your cat’s cognitive function. They are important in the maintenance of a healthy neural network. Blueberry is a superfood that is low in fat and high in fiber. It is a much better treat than those that you buy from pet stores which can contain more calories and fats than necessary. It can help with your cat’s weight issues, too. The best thing about these berries is that you can give them raw. You can always go fancy, however, by creating a smoothie and then putting it into the freezer. You’ll have a frozen treat that your kitty will love. You know that your cat doesn’t like drinking too much, right? You cannot blame it, sad to say. Its ancestral behavior is still strong in its DNA. It only relies on the moisture content of the prey animals that it subsists on. If you are feeding your feline friend whole prey animals, then hydration is never an issue. The same is true if you are giving Garfield wet cat food instead of kibbles. But if your pet isn’t drinking water or not eating moisture-rich foods, then giving it melon every now and then won’t hurt. You have two choices: cantaloupe and honeydew. If you want to give your cat a sweeter treat, then the honeydew is best. If you’re looking for more fiber for your pal, then the cantaloupe is the one to get. Either melon will give your cat an excellent source of water to keep them hydrated. Melons are also rich in flavonoids – substances with amazing antioxidant properties. You can serve your cat with fresh, bite-sized slices of melon or you can turn it into a frozen delight. You didn’t see this coming, did you? Not everyone likes gizzard or the muscular part of a chicken or turkey’s stomach. So why would you want to give your cat this human food? Simple – chicken or turkey gizzard is one of the best sources of lean protein. A single serving of these chicken innards contains almost 90 percent protein. Not only that. It is also rich in zinc, iron, and vitamin B12. These nutrients can help boost your immune system, promote healthier red blood cells, and enhance nerve function. You can purchase gizzards from your supermarket. They often come in packs of giblets that can include other poultry innards like heart and liver. You can also give these innards to your pet. However, you should give them in moderation because of the higher fat content. You may raise your eyebrows with this one. It’s true that cats deserve only high-quality meats owing to their carnivorous nature. But giving them whole grains every now and then can also help provide nutrients that may be lacking in other foods. Whole grains like oats are rich in B vitamins, selenium, iron, and magnesium. They also have omega-3 fatty acids that can make your cat’s fur a lot healthier, smoother, and shinier. Some cats prefer polenta, couscous, or millet while others go for brown rice, wheat berries, or barley. Whatever whole grain you wish to give to your kitty, make sure that you cook it well. This is to help them digest these grains a lot better. Remember, their intestines are that of a carnivore, not a herbivore. These are some of the human foods that are safe to give to your pet cat. 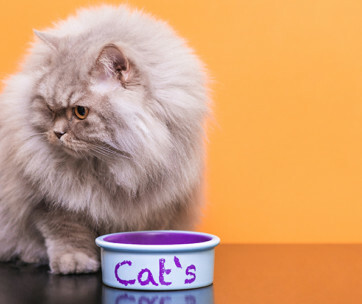 Do keep in mind that these foods should never replace your cat’s regular diet. These human foods are good only as occasional treat, not as meal replacement.